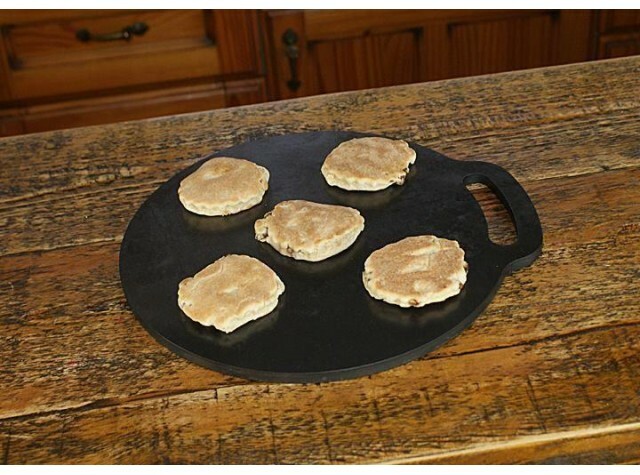 Heavy weight Welsh Bake Stone10mm thick high quality pickled steel which is harder, stronger and has a better heat retention than the old fashioned wrought iron bake stones, whilst keeping the same rustic look.Made in Bridgend.Must be seasoned before use, does come with instructions. 10mm thick high quality pickled steel which is harder, stronger and has a better heat retention than the old fashioned wrought iron bake stones, whilst keeping the same rustic look. Must be seasoned before use, does come with instructions. These bakestones are made for Valley Mill by Dragon Laser in Bridgend, who have over 20 years experience of providing a bespoke manufacturing service using impressive high-powered laser machines.